Thank you to all of our members and supporters who attended our programs in the fall of 2018! Please find the details of what was offered below. Royal Oak Programs are a vital part of the foundation's ongoing educational mission in the United States. Since the series began, Royal Oak has planned and presented over 1000 lectures by over 220 speakers in 66 different cities across the United States. Our Fall 2018 programs are made possible by The Drue Heinz Trust and additional support from the Marian Meaker Apteckar Foundation and an Anonymous Donor. The Royal Oak Foundation’s 2018 national program of lectures was made possible by the generosity of the Drue Heinz Trust, our lead sponsor for the past 26 years. The support of the Drue Heinz Trust enables us to maintain a high quality of programming each season and for this we are deeply appreciative. For the Fall 2018 season we also gratefully acknowledge additional support for The Drue Heinz Lectures from the Marian Meaker Apteckar Foundation and an Anonymous Donor. We are grateful to loyal Royal Oak members for generously providing supplemental funding and gifts-in-kind for lectures and tours this season, including: Mrs. Melanie Boltax, Virginia Brody, Mr. and Mrs. Dwight M. Cleveland, Diana Mackie, Mr. Albert Messina and Mr. Ken Jennings, Sandy Muller, Chris and Laurie Nielsen, Mr. Robert Ohlerking and Mr. Christopher LiGreci, Dr. Quinn Peeper and Mr. Michael Harold, Ms. Lynne R. Pickens, Mr. and Mrs. Richard Spain, The Stoddart Family, John and Phillis Warden, Mr. William Lee Younger and two Anonymous Donors. Thank you also to FREEMAN’S for supporting some Royal Oak lectures in Boston, Charleston, La Jolla, Los Angeles, New Orleans, Washington D.C., and Philadelphia. Our deep appreciation goes to Arader Galleries for hosting our San Francisco lecture and reception and our thanks to Holland + Macrae, the Atlanta Decorative Arts Center, and Spalding Nix Fine Arts for their assistance and gracious hospitality in Atlanta. Thank you to Hyde Park Antiques for partnering with Royal Oak on our NYC Chippendale 300 celebrations. 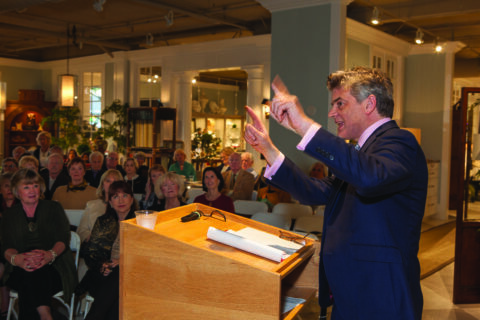 We are indebted to the Charleston Library Society in Charleston, the National Churchill Library and Center in Washington DC, and the New England Historic Genealogical Society in Boston for hosting our lectures in those cities. No tickets will be issued. You must register in advance for all programs. Registrations will not be held without payment. Your name will be on our guest list at the door when you check in. Your guests might be listed under your last name. We cannot guarantee seating for late arrivals. There is a formal business attire dress code at some lecture venues (marked in individual lists) for which shorts, jeans, sneakers, and tee shirts are not acceptable in any weather. Royal Oak is not responsible for venue dress code policies. Incorrect attire may result in your being turned away at the door by the venue staff.